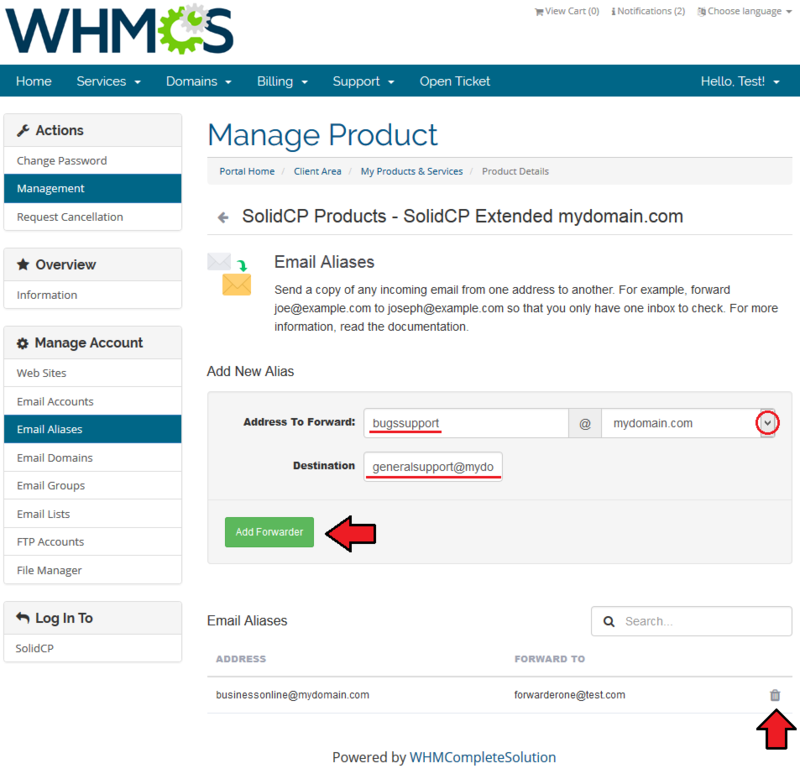 SolidCP Extended For WHMCS makes the provisioning of accounts fully automated. 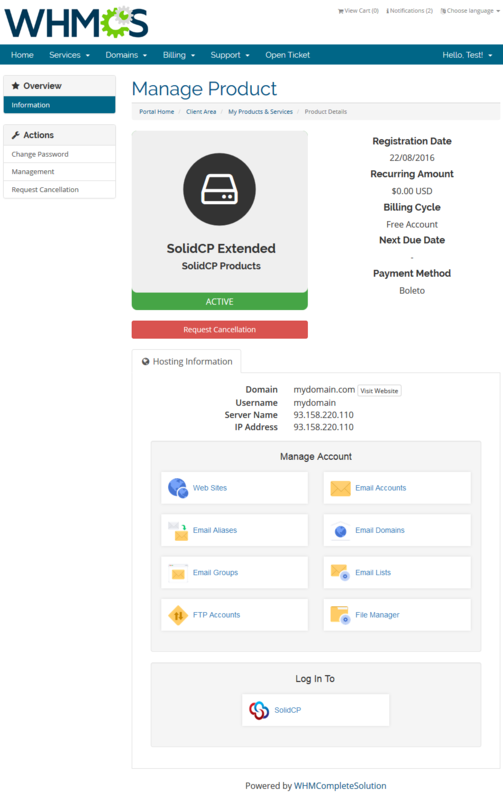 The module allows quick and easy management of FTP accounts, websites, emails and many others, all that performed directly in the WHMCS client area. Inbuilt admin panel will let you adjust each product individually and decide which functionalities shall be available to your clients. 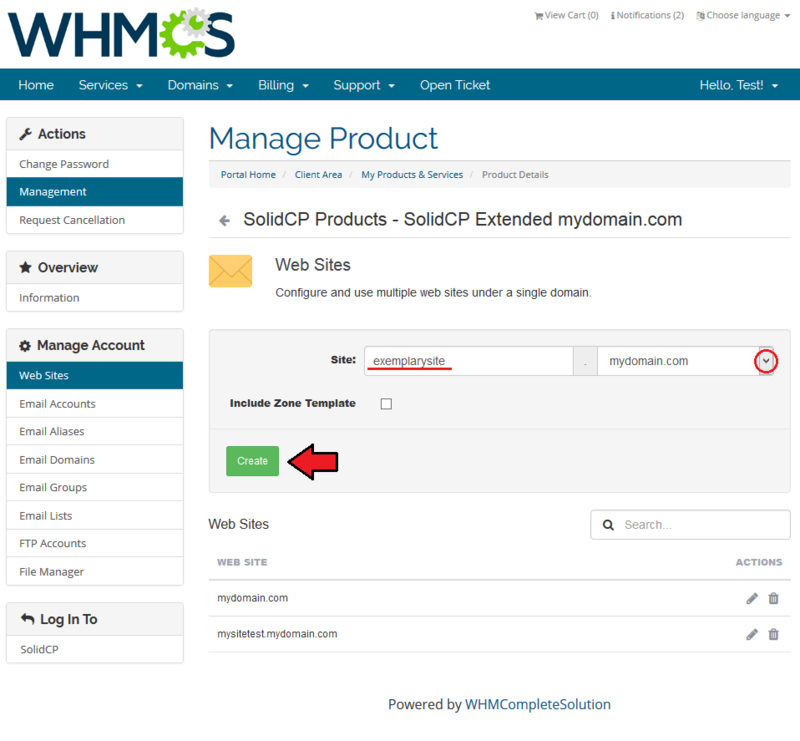 Read the below instructions to learn how to install and then configure SolidCP Extended For WHMCS properly. We will guide you step by step through the installation procedures. Note: You can check the current PHP version in your WHMCS. To do so, proceed to 'Utilities' › 'System' › 'PHP Info'. 4. 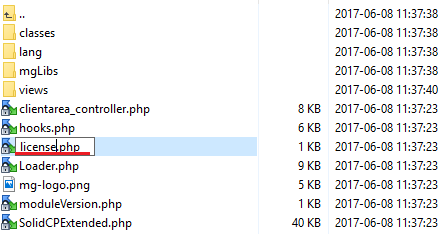 When you install SolidCP Extended For WHMCS for the first time you have to rename 'license_RENAME.php' file. File is located in 'modules/servers/solidCPExtended/license_RENAME.php'. Rename it from 'license_RENAME.php' to 'license.php'. 5. In order to configure your license key you have to edit a previously renamed 'license.php' file. 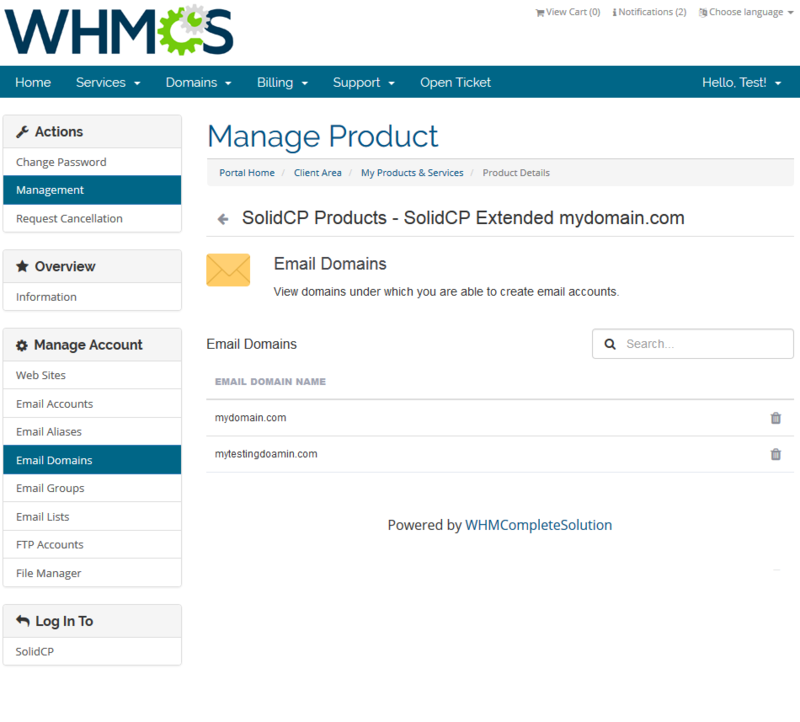 Log in to your WHMCS admin area. 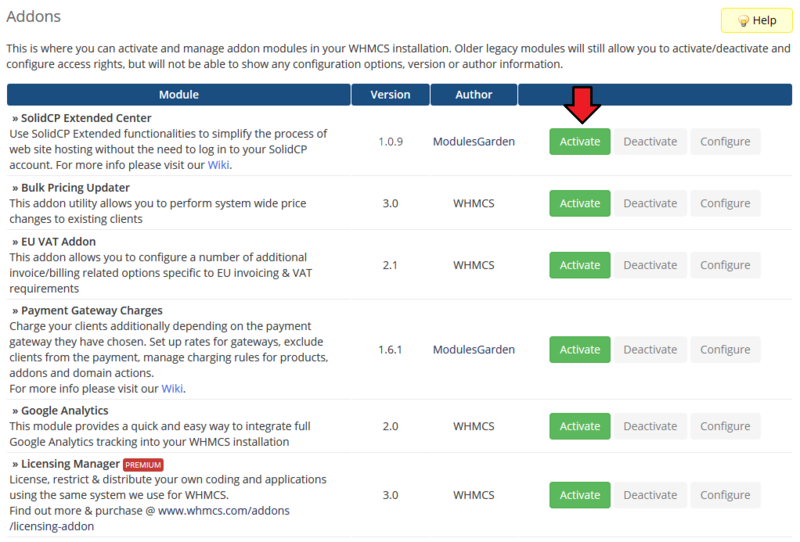 Click 'Setup' and find 'Addon Modules'. Afterwards, find 'SolidCP Extended Center' and press 'Activate' button. 7. In the next step, you need to permit access to this module. 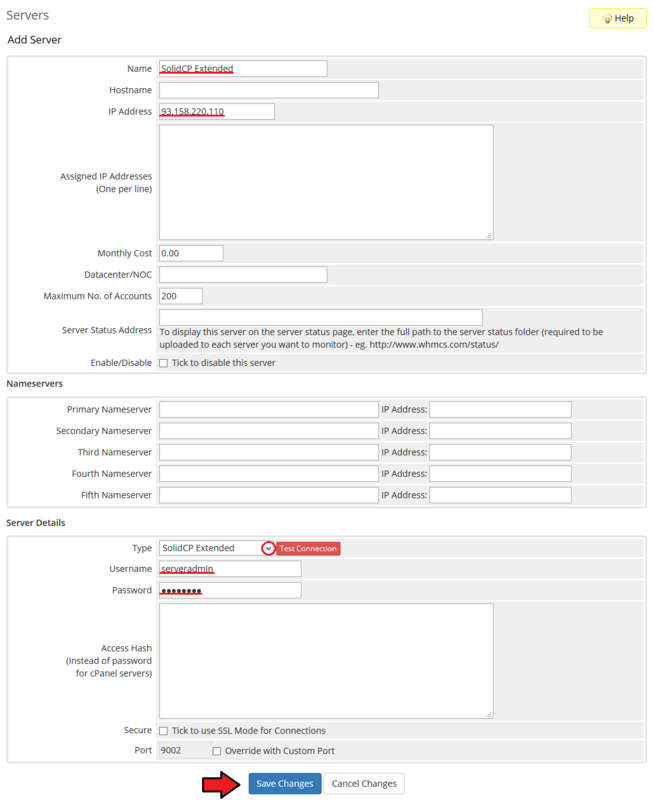 To do so, click on 'Configure' button, tick desired admin roles and press 'Save Changes'. 8. 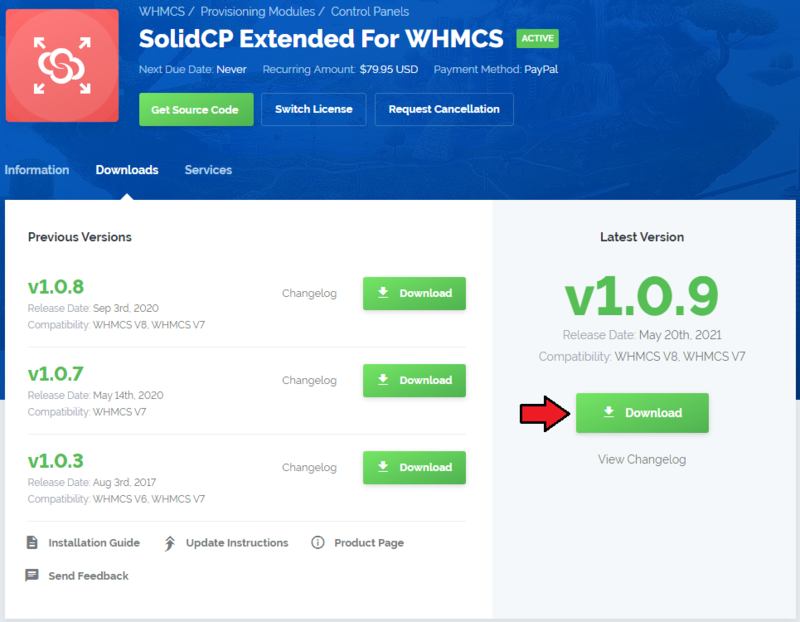 SolidCP Extended For WHMCS is now successfully installed! 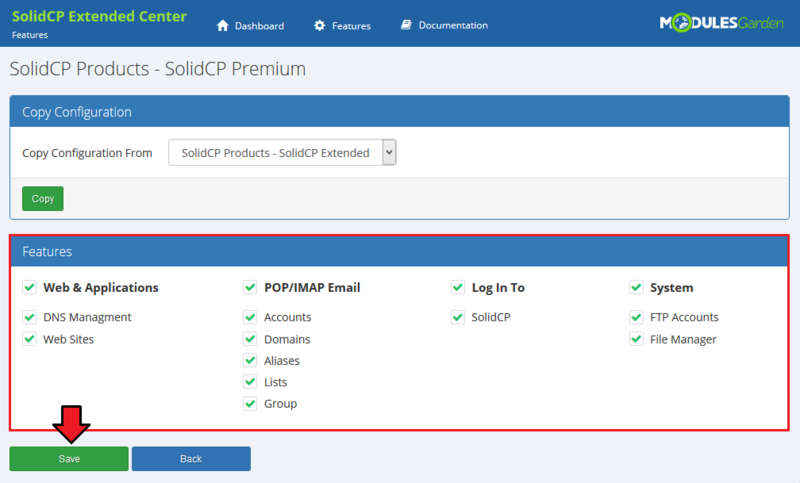 Access the addon under 'Addons' → 'SolidCP Extended Center'. 9. To begin, you must add a new server. Go to 'Setup' → 'Products/Services' → 'Servers' and press 'Add New Server'. 10. Enter your server name, IP address, username and a password. Choose 'SolidCPExtended' from a dropdown menu and press 'Save Changes'. 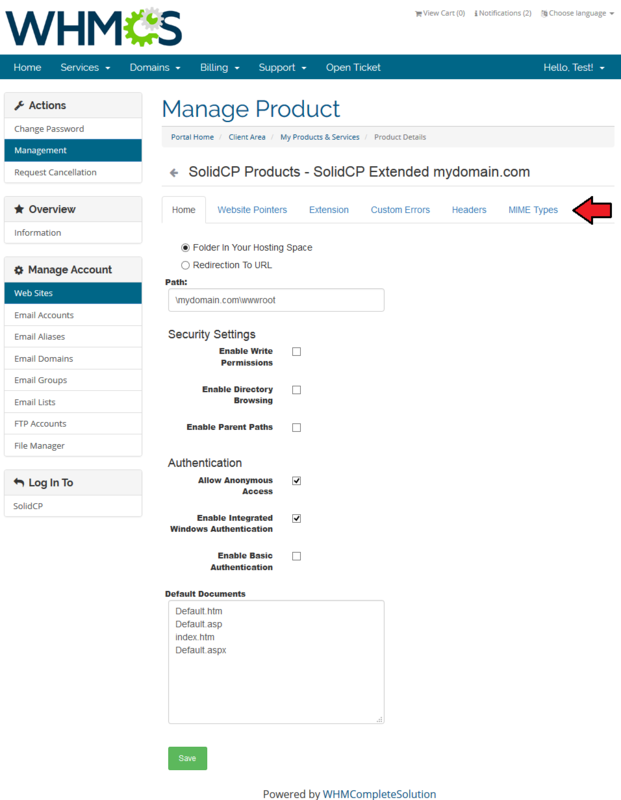 If you connect with your SolidCP server via SSL, then make sure that you checked 'Secure' located at the bottom of the page. 11. Once your server has been configured correctly, you will see a following screen. Create a new group for your server. Press 'Create New Group' to follow. 12. Enter name, click on your previously created server, press 'Add' then 'Save Changes'. 13. In order to create a product, go to 'Setup' → 'Products/Services' → 'Products/Services'. 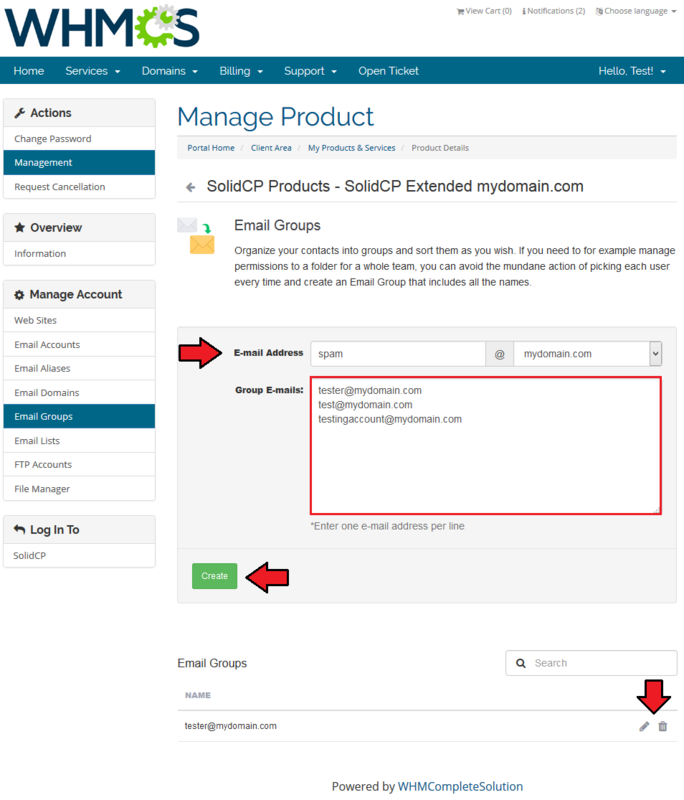 If you do not have a product group, click on 'Create a New Group'. If you do, simply skip step 13. 14. Fill in a product group name and press 'Create Group'. 15. 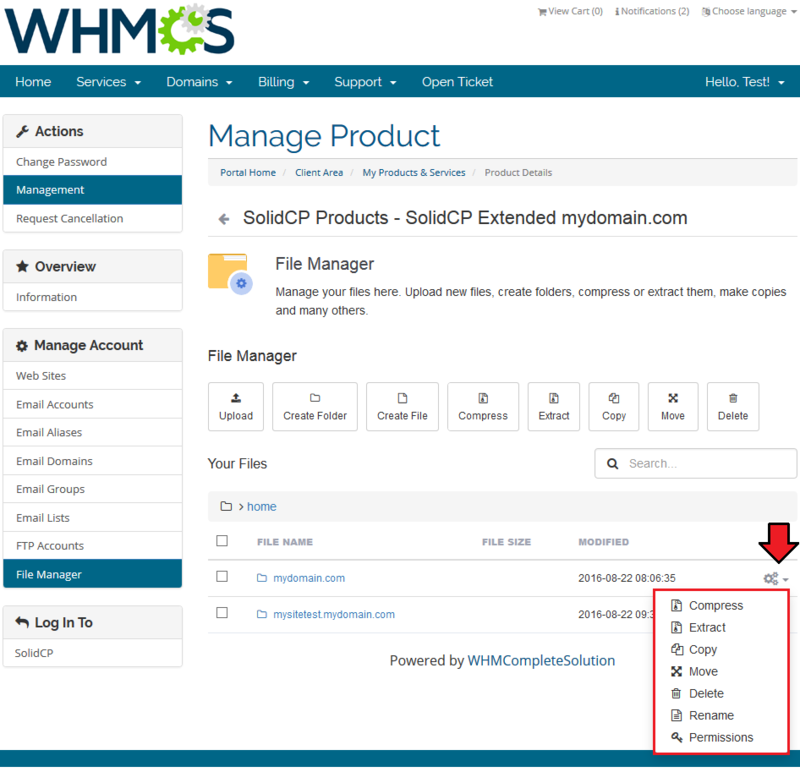 When you have a product group added, you can create your product and assign it to SolidCP Extended module. 16. Afterwards, choose your product type and product group from dropdown menus, enter your product name and press 'Continue'. 17. Now, go to 'Module Settings' section, choose both 'SolidCPExtended' and a previously created server group from dropdown menus and press 'Save Changes'. 18. Fill in required data to form you product. Confirm through pressing 'Save Changes'. 19. You have just correctly created and customized a new product. press 'Documentation' tab to be moved to this very site! 20. Proceed to 'Features' section and find the product you are interested in and press 'Configuration' button next to it. 21. You should find there boxes dedicated to 'Copy Configuration' and 'Features'. 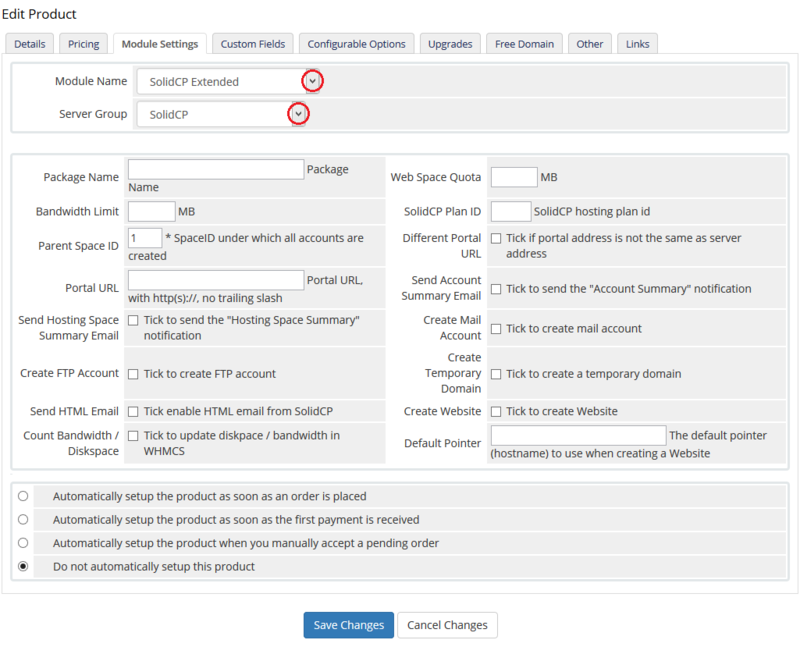 If you have already another product configured, you may copy its configuration now. 22. 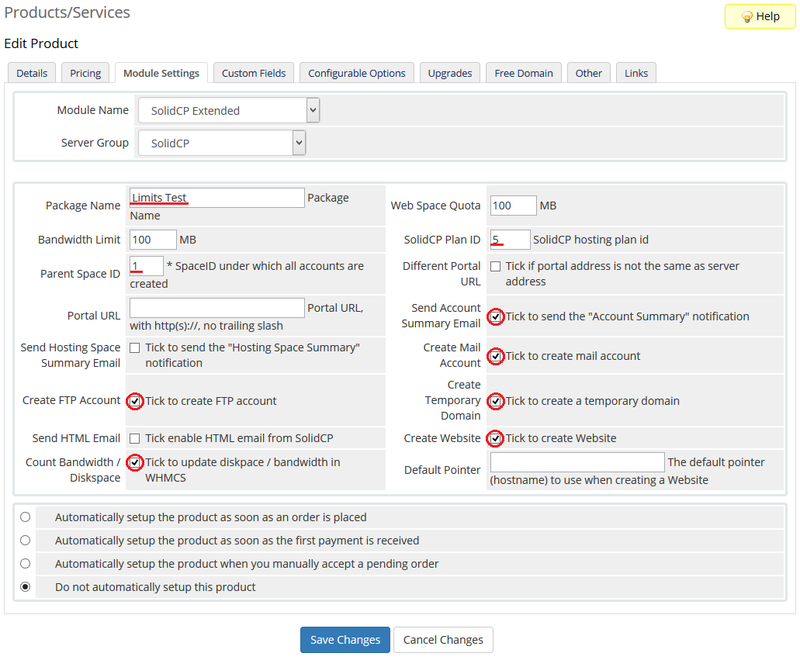 To show you an example, we will set the configuration from the beginning, we will not use other product's configuration. Select the features you would like to activate for your customers and save the changes. 23. 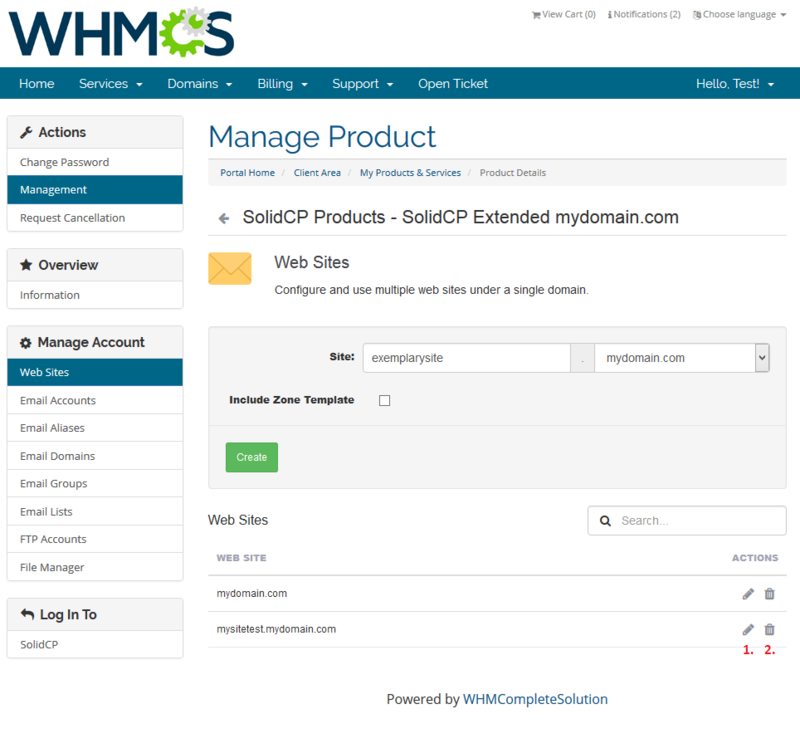 From now on, all your clients who ordered a previously created product will be able to manage their SolidCP accounts via your WHMCS system. 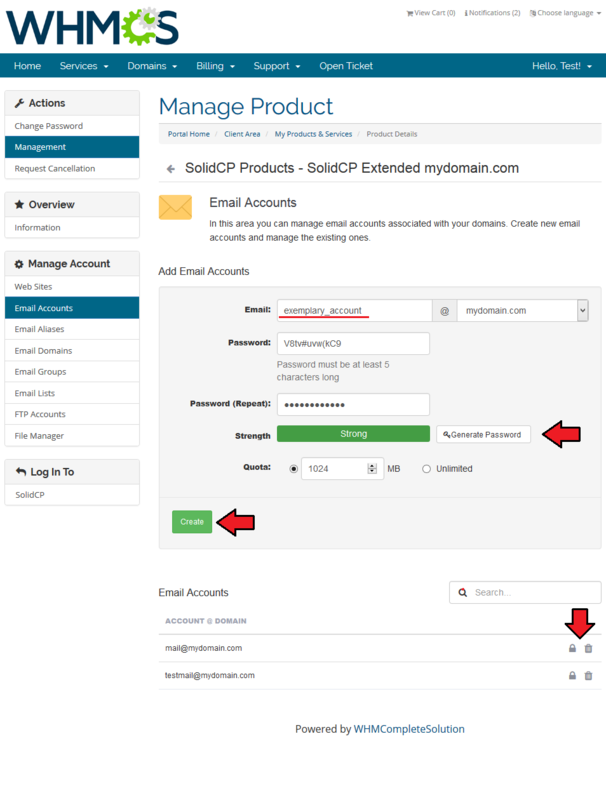 SolidCP Extended allows your customers to manage their SolidCP accounts without being logged into the server. 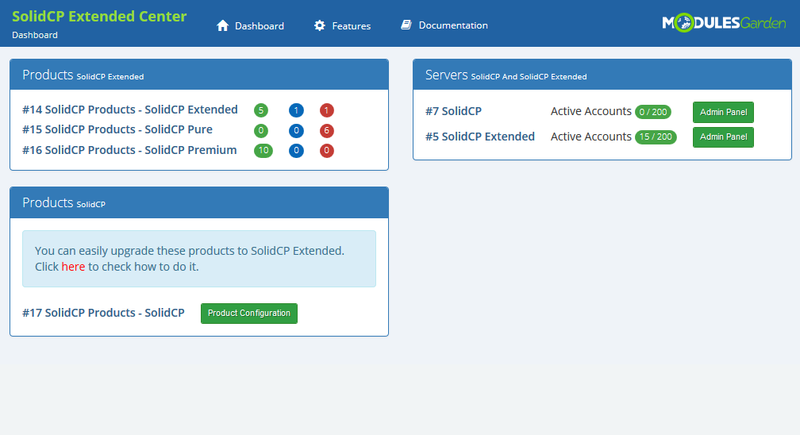 Read the below descriptions to become familiarized with all of the SolidCP Extended functionalities. In the following section, features available in the client area will be presented. Under the first subsection you can add your websites. Type in the web site address and select one from your domains. You may always delete (2.) or edit (1.) an existing website. Use action buttons marked on the screen to do so. When you press the pencil icon, you are moved to place where details on your website can be updated. Create and edit email accounts that are associated with your domains. Modify or remove mailboxes. To add a new mailbox, press 'Create'. 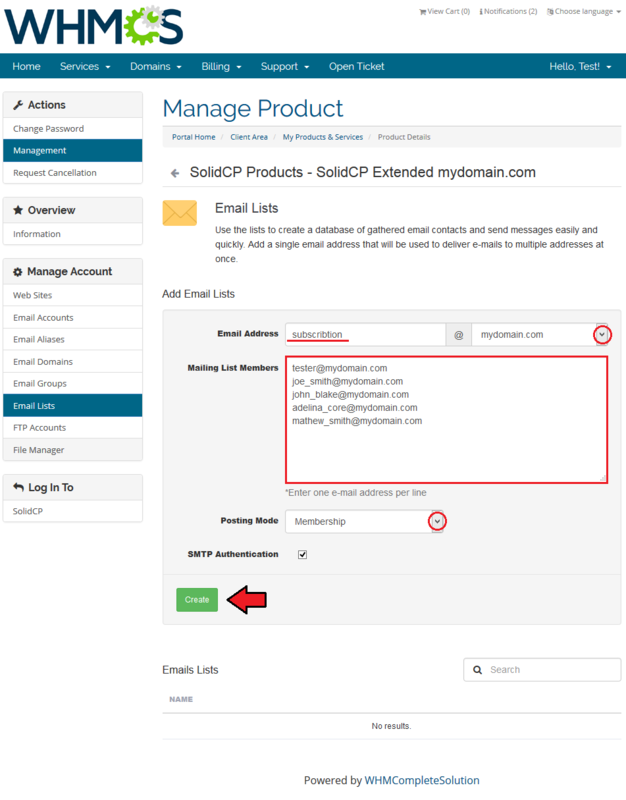 Set up email aliases, fill in the address of one of your mailboxes and choose its domain. Then, fill in the full list of email addresses to forward to and press 'Add Forwarder'. You may remove the forwarder whenever you need. Addon domains allow you to link the domain to a subdirectory of your account. Manage addon domains, create subdomains, use password generator to enjoy full security. Redirect and assign users to crated addon domains. Now, provide an email address which will be used as an email resender. Additionally, fill in the list of email addresses which should receive email and press 'Create'. Prepare email lists. Add several email addresses to one list to avoid sending one message to numerous users one by one. Predefined lists make the sending notification system much more advanced and faster. 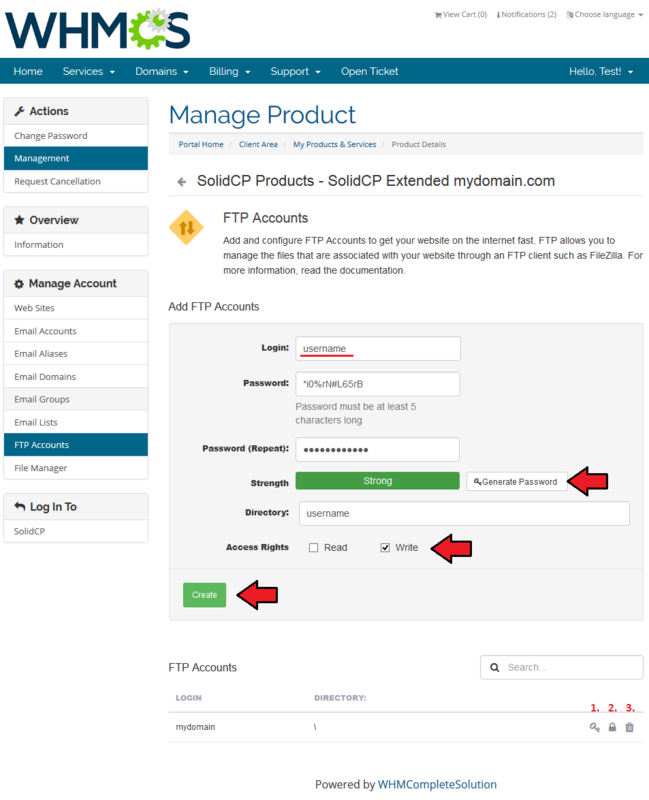 Add and configure FTP Accounts in the easiest way possible. Just type in login, generate a totally secure password, provide directory and define access rights. 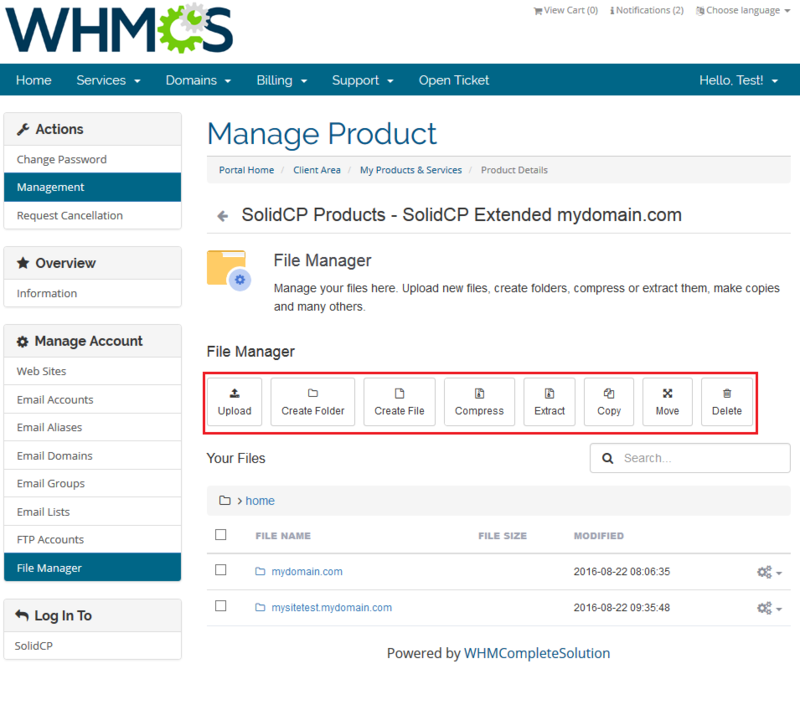 Manage files and folders of your SolidCP account. Upload files, create folder to categorize the files, compress, extract etc. View the list of files with specific data on them: name, file size and last modification date. Get quick access to your SolidCP Panel with just one click. You don't even need to fill in your username and password! 1. If you have plenty of products in your offer, you may quickly copy their features to save a lot of time. 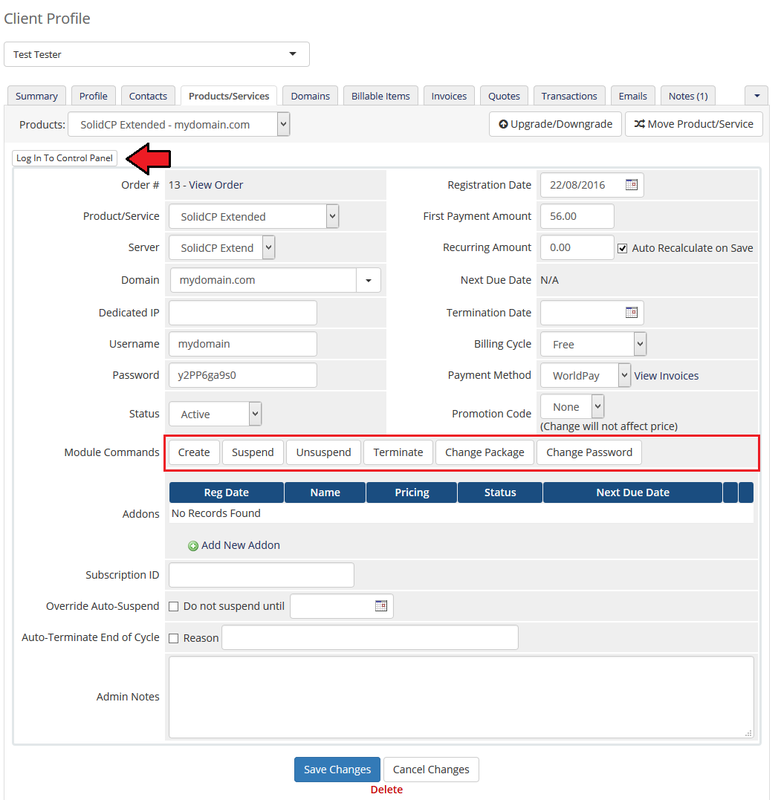 Simply find option 'Copy Configuration' under each of the products. 2. 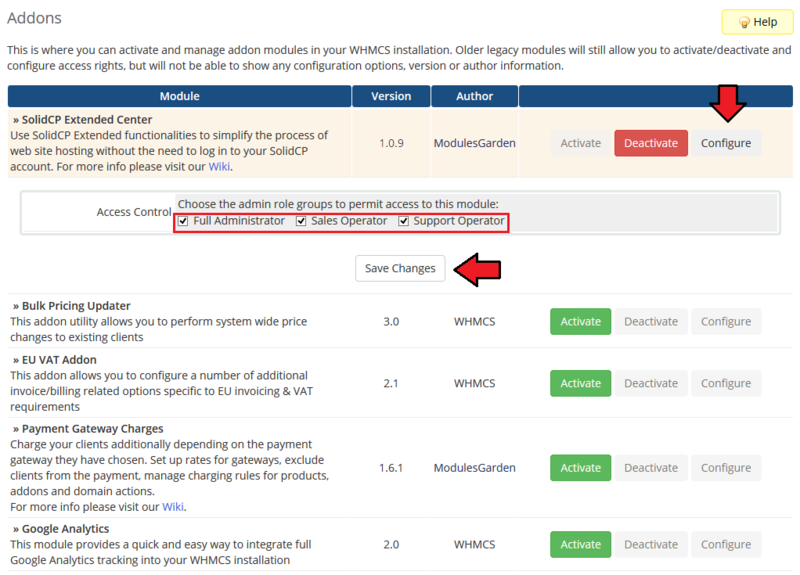 As this module supports templates system, any changes made in the module's templates files will be saved after the upgrade process. This page was last modified on 11 March 2019, at 09:32.